This morning, I finished the last of my pre-6.2 patch bucket list. I went from Neutral to Exalted with Sha’tari Defense, the reputation associated with the Garrison Trading Post, in three hours. It was fast, it was fun, it was easy. I’ve avoided working on this reputation because of the insane length of time it would take to solo it out. 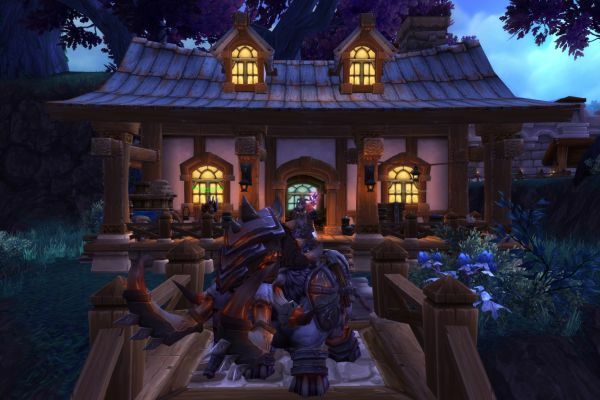 There will be things like a Garrison Quest in patch 6.2 that gives 1000 rep towards it that will help, but if you’re looking to clear the decks BEFORE the patch drops, maybe this will help out. The pre-requisites to accomplish this are having an Alliance Trading Post at least to level 2 so that you unlock the Sha’tari Defense reputation, and preferably to level 3 for an extra 20% reputation boost. It is very helpful to also have a Battle Standard of Cooperation or other Guild Banner (sold from Guild Vendors) that you can drop on cooldown to award bonus rep. Oh yeah, and be level 100, of course. The way I did it is the same way I see most people getting it done lately, forming a 5 person group in the Custom Group Finder tool, and then hitting the Path of Glory. 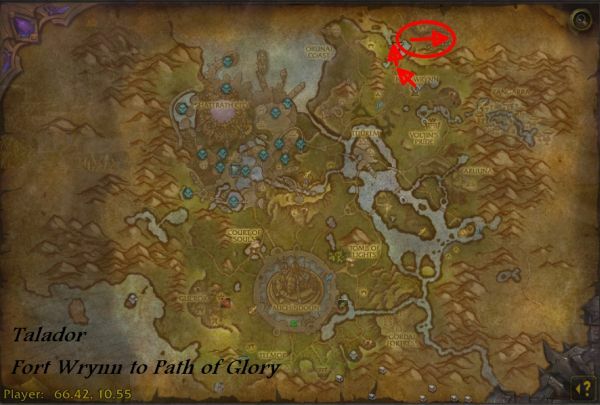 You see, there is a place in the Northeast corner of Talador called the Path of Glory, leading right to the massive iron gates blocking the way to the jungle. You can get here quite easily as Alliance by flying to Fort Wrynn (where you started in the zone) and riding along the path to the place where it forks before the citadel. Here you will find the Path of Glory, just by taking the branch of the path to the right. It’s a very short cul-de-sac that ends at the massive Iron Gates. 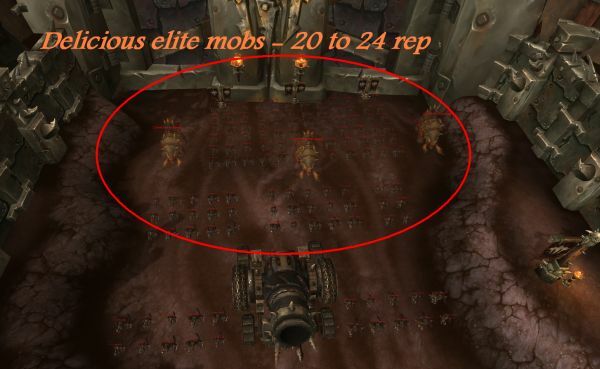 And before these gates, tasty, tasty elite mobs that award Sha’tari Defense reputation. Lots of it. EACH. While I’m sure my Death Knight pal Monstre could walk in here and solo them all, I’m not quite so sturdy. So, it’s time to find some friends, fast. There are LOTS of folks trying to get this rep done. All you need to do is start or join a 5 person group. 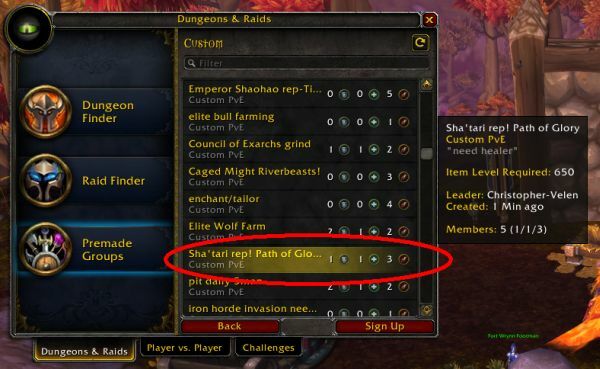 Raid groups larger than 5 don’t receive rep for kills, so you need to make a 5 person one to get this done. 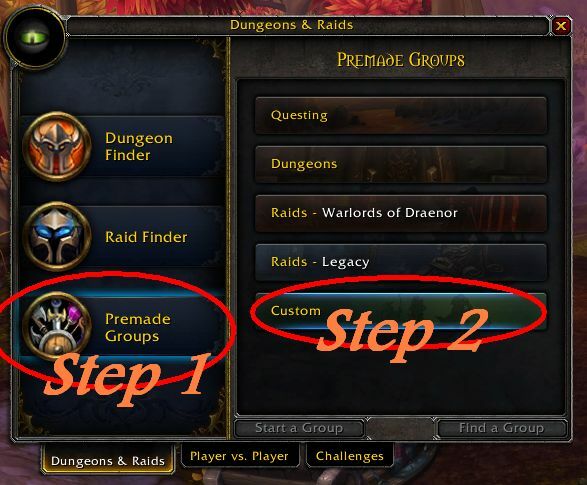 Just in case you haven’t used the new Dungeon Finder tools to do this before, you need to choose Premade Groups and then the Custom sub-category. If you’re a tank or healer, it should be simple to find a group. If you’re DPS, you may want to make your own. I was fortunate enough to join a group as DPS that still had a few open slots. We ended up with a raid geared Monk tank, two destro Warlocks, a balance Druid and an arms Warrior. No, we had no healer, and yes, that made some of the pulls where we grabbed everything a little tricky. We had to time things to make the really big pulls when the tank had a lot of cooldowns available. 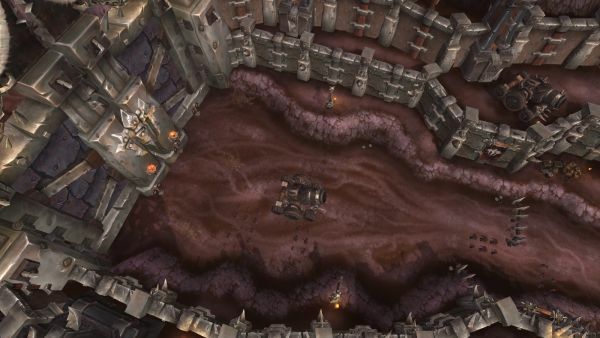 Still and all, dropping the banners, using our Warlock AoE stuns, dropping massive AoE damage (gotta love Rain of Fire and Fire and Brimstone), even without any heals we cleared the area in front of the gates repeatedly as soon as the mobs respawned. And the spawn FAST. We’d usually still be finishing off the last few from barrel toss pulls as the respawns began trickling in. You are not left waiting. Three hours of clearing the area, minus probably a half an hour of messing around as people wanted to hearth to Garrison to buy banners from the guild vendor and be summoned back, then hearth to the Garrison to upgrade (or build!) their Trading Posts and then be summoned back. Or go walk their dog. Or look for a garage remote for some strange reason. The rewards for finishing this rep are pretty good. Aside from a really nice set of Plate armor that is transmoggable (and binds on pickup, so if you want it make sure to run this on your plate-wearing character!) there is also the nice bloody elephant mount shown above, and two toys, one of which transforms you into a Draenei plate-wearing Sha’tari Defender for an hour. Transforming items that last an hour are pretty rare, so it’s a very nice toy. Oh yeah, and you’ll be able to buy the Sky Fry pet, as well, if you haven’t bought him off the Auction House. Personally, I’d recommend a standard 5 person group of tank, healer and three DPS instead of trying it with no heals. All it takes is grabbing a group too big with no tanking cooldown available and you’re in for a short run back from the graveyard. I’ve been wanting to do this and putting it off for at least five months now, all because I didn’t want to solo an endless grind. But a three hour clear? I think any of us can handle that, if only once. And if you don’t get all the way there with your first group, there is always another you can join or form. Did I mention that group finder is cross-server? Just in case you haven’t ever used it and were worried not many might know of it or use it from your low population server. No, it’s widely used, and extremely convenient. I don’t know what will happen when patch 6.2 comes along. I think this area in front of the gates to the jungle will be opened and the elite mobs will no longer be so convenient to munch on. 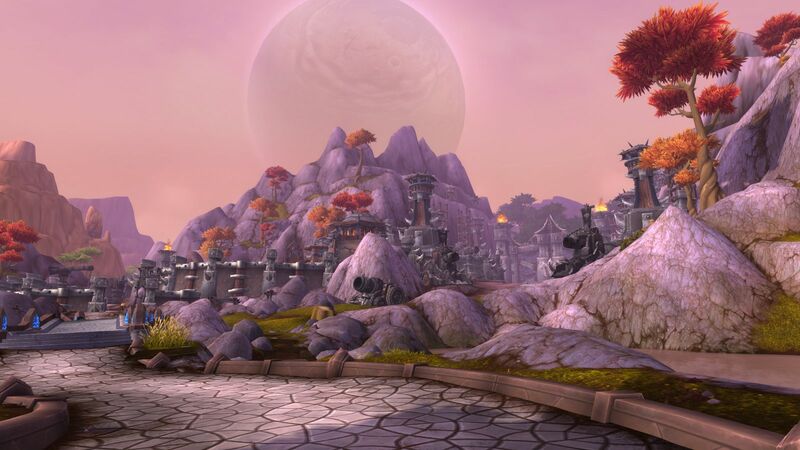 Maybe in three days you’ll be back to farming reputation in the harbor or Shattrath City. Whatever happens, if you’ve been hanging back, I hope this encourages you to take the step to get it done if you’re at all wanting the toys, mount and pet. I know I’m very happy I did. Only thing that would have made it better was if I’d done it with some friends. Custom groups have been my favorite new thing. I’ve been able to do things that would never be possible on my server in the daytime. I had to do some solo grinding for Sha’tari Defense as most groups were ephemeral but wow did it ever make it easier. Rarely had a full group and the weirdest thing was no group ever had a healer. I kept trying to figure out why healers weren’t playing in the daytime but couldn’t come up with a theory.